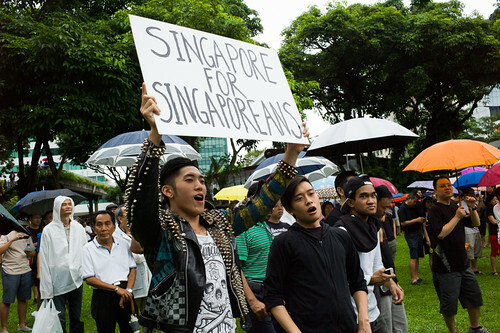 A youth holds up a placard proudly proclaiming “Singapore for Singaporeans” at the historic protest in Singapore against the government’s population white paper, the largest bi-partisan protest since Singapore’s Independence. 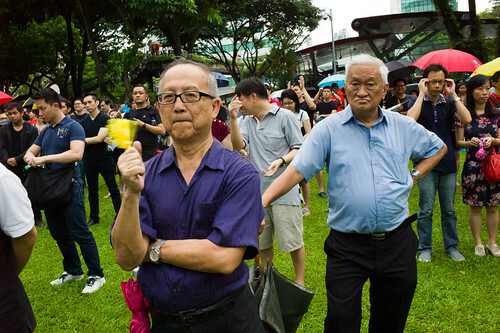 On the 16th of February, the largest gathering of protesters post-independent Singapore has ever seen, numbering more than 5000, congregated on the open field of Hong Lim Park (also known as Speakers’ Corner) in a historic bi-partisan protest against the Population White Paper, a plan by the Singapore government conceived out of the challenges of an aging Singapore population. The government has for years run the country by numbers, boasting of economic growth while neglecting, even ignoring the difficulties of the people they claim to serve. Crowd attendance was more than 5000 by all estimates. Because of the rain, not everyone got onto the field, which meant 5000 is conservative. This group of guys wore jerseys emblazoned with the Singapore flag and carried Lions XII soccer team scarfs in support of the protest. 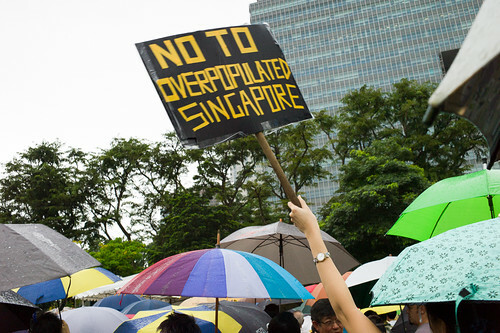 Singaporeans want to be heard, and they want to be heard about the population white paper. 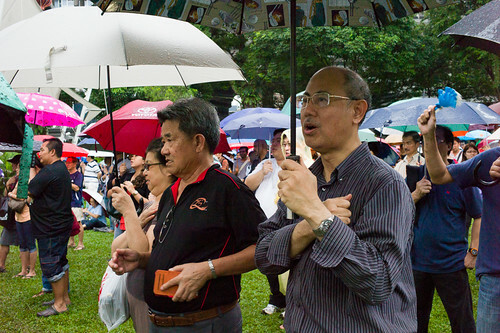 The anger and disbelief of the protesters, and indeed, most Singaporeans, even MPs of the ruling party, who are apparently not privy to nor consulted with during the conception of the plan, was palpable – young and old, kids and older folks wave placards, shouted slogans and made known their anger in public, a rare sight in the somewhat authoritative state of Singapore where public dissent was often frowned upon and the rights to hold a protest often withheld below so many layers of bureaucratic red tape that it was often not feasible. 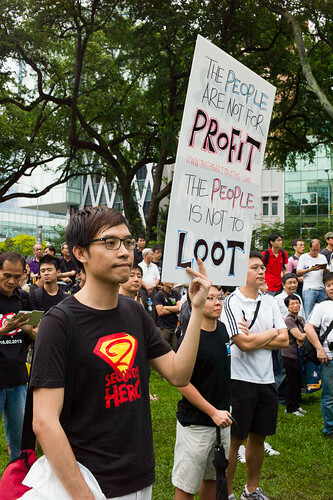 More than that, the fear of reprise against any public remonstration of dissatisfaction loomed over Singapore for many years following very public legal cases and (some say, secret) persecutions. 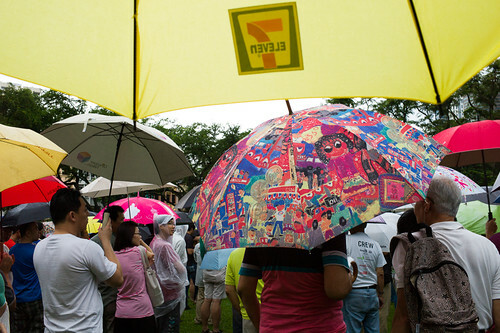 Rain or shine, the protest goes on amidst a dazzling display of different umbrella designs. 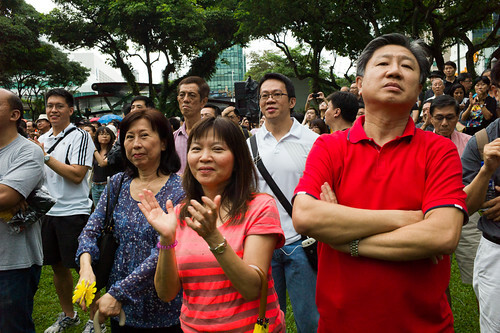 A united family standing in protest at the historic mass rally, the largest bipartisan protest since Singapore’s independence, with more than 5000 in attendance. A guy in a Guy Fawkes mask speaking to his friend about the protest. 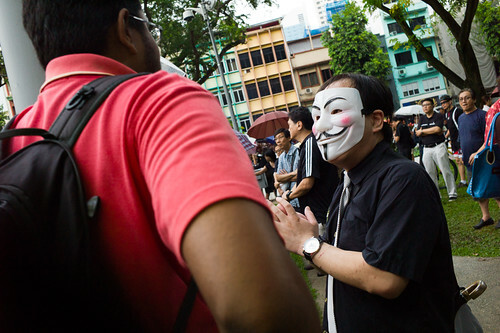 The mask has come to symbolize protest, and was featured in the movie V for Vendetta. 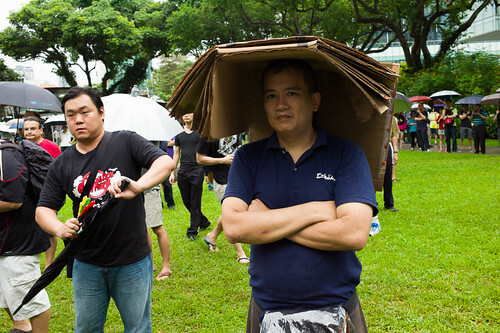 Undeterred by the rain, this man is a symbol of defiance against the policies laid down in the population white paper. 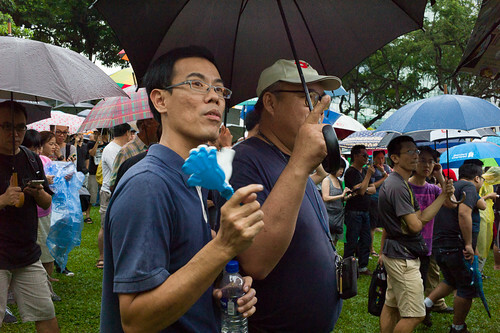 Rattling his clapper loudly, this man is full of support for the protest. Both the young and old are united by a common spirit. 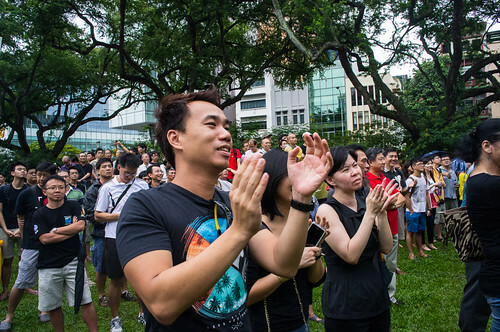 A supporter applauding the speaker at the protest. Young and old flocked to the protest wanting their voices to be heard. 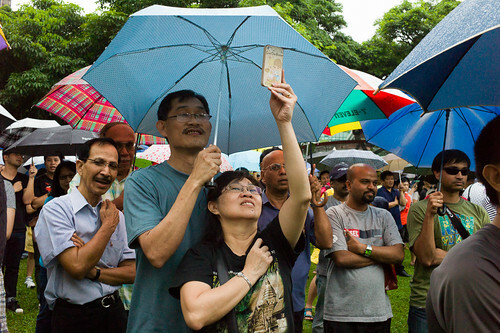 The Government’s unveiling of the plan to have 6.9 million people eventually in the very small island state of Singapore by 2030, and worse, to have only slightly more than half of that figure to be made up of native Singaporeans blew up well in its face, especially after the devastating defeat at the Punggol By-Election at the ends of the Workers’ Party. This initial uproar caused several members of the ruling party, including Khaw Boon Wan and Prime Minister Lee Hsien Loong himself to backtrack, saying the 6.9 million figure was only a worst case scenario for planning purposes. 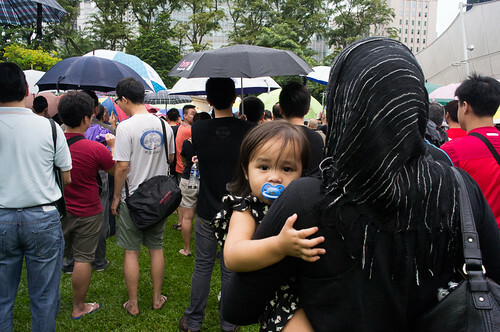 I saw a lot of young Singaporeans at the protest, a healthy sign that we are not as apathetic and apolitical as most think. We care. Without the lure of free food and free transport typical of the ruling party to bring supporters to their events in an organised fashion, the people came here on their own, rain or shine. 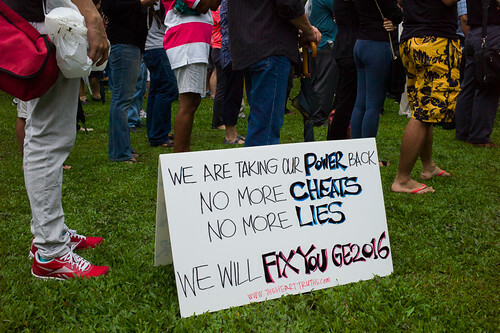 The over-riding message – “We will fix you 2016”, making a reference to the next scheduled General Election in Singapore. 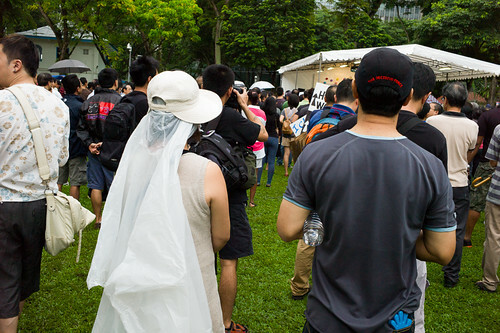 At first I thought a bride had come to join in the protest! Clappers, whistles and cheers add to the carnival like atmosphere of the protest. 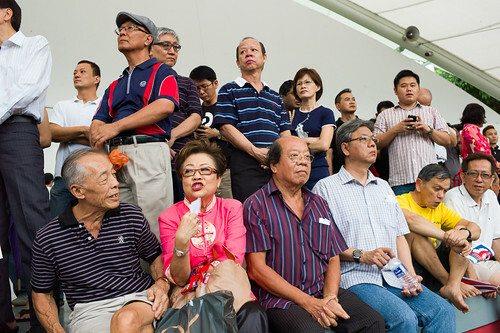 It was then promptly pointed out to these leaders that in the past, the ruling People’s Action Party has always exceeded their “worst case scenarios”, made worse by members of the old guard (whom many consider incompetent and the source of problems today) like the clueless Mah Bow Tan exhorting Singapore to “go for the maximum”, creating a classic “facepalm” situation and possibly bringing about the coup d’etat for the ruling party come 2016, where the General Elections will take place. 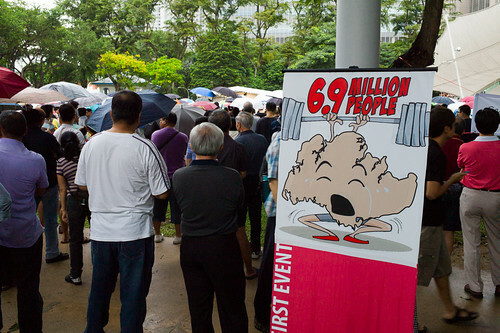 The message to the government was clear and simple – NO to 6.9 million in Singapore. People listened to the line up of 13 speakers talk about the problems of population. Housing, transport woes, over crowding and lack of jobs were sore issues. Should I migrate to make more space? Many came to the protest for the sake of their kids. 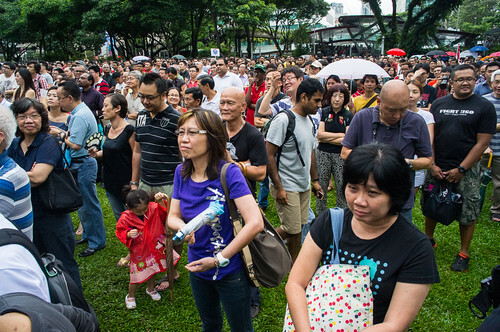 Would they have a place in school, a job in the face of 6.9 million people, half of which are not Singaporeans? Even at 5.3 million, Singapore’s transport, housing and infrastructure are already straining under the weight. Just look at our pathetic train system! 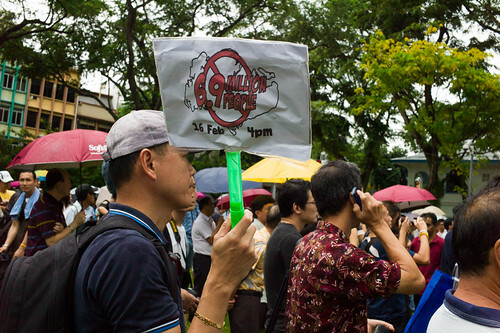 There was then an extensive parliamentary debate over the white paper, with members of the opposition Workers’ party offering up several alternatives, but the result was never in doubt – as under the party whip, Parliament passed motion (pun intended) on the White Paper, with 77 ayes and 13 nays, prompting cries of “wayang” (play acting) on the whole idea of a debate – that the ruling echelon had already made up its mind, and that the debates were merely all a show. 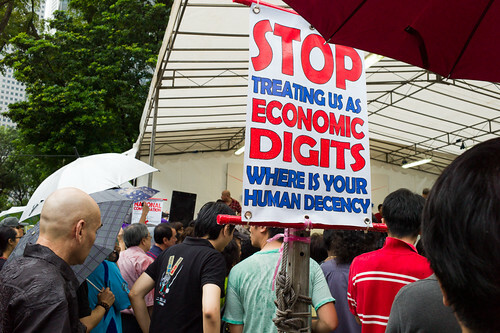 Placards were seen making a mockery of the number 6.9 million…. Ah Loong refers to the Prime Minister, and 6.9 million is the one population figure the people made clear they do not want. 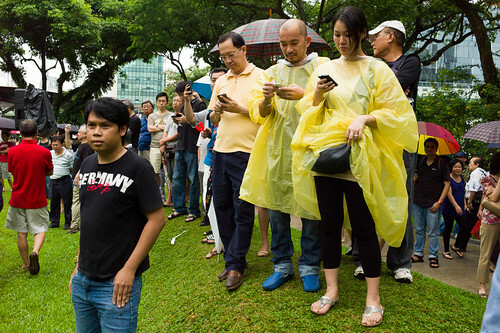 Braving the weather, people live tweeted / instagrammed / pathed / facebooked the event in the large display of citizen journalism. Protesters reciting the Singapore pledge in a giant show of patriotism and love of our nation. 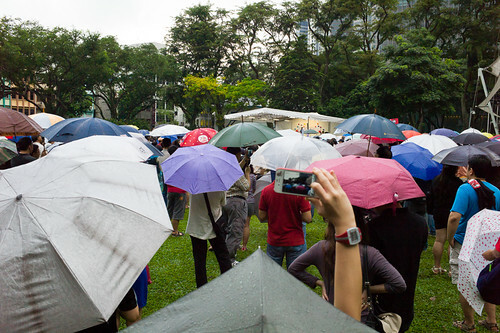 I witnessed history being made yet again (after the 2011 General Elections, the Punggol East By Election rally, the victory celebrations of the by-elections) that rainy day at Hong Lim Park. I came to photograph a protest, but in the end, I photographed the spirit of the true Singaporean that day, a collective anger at the status quo, a dissatisfaction with the government for turning a deaf hear to many of our concerns, and more importantly, a renewed spirit which cast off the apathy and apolitical mindset of old, a spirit that craves for change, and a belief that we as a nation can, and must, determine our own fate. 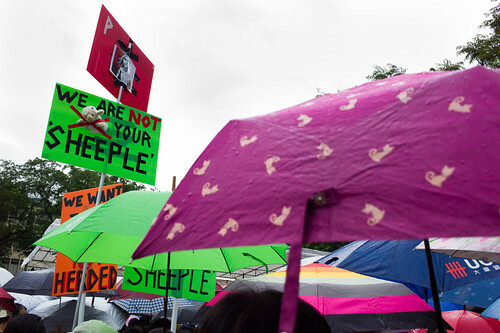 We are not your sheeple – the placard proclaims, making a reference to people being treated like mindless sheep in Singapore. Real soft toy sheep used there! 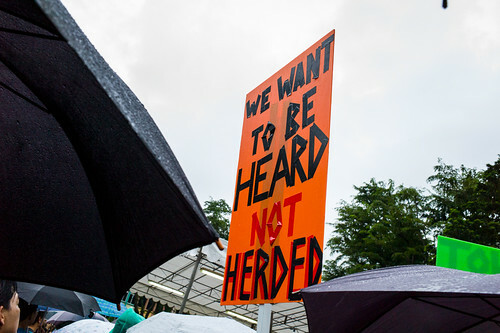 We want to be heard, not herded – possibly my favorite tagline from the protest! We are Singapore, and this is our home. And I’m glad to say, we have matured. 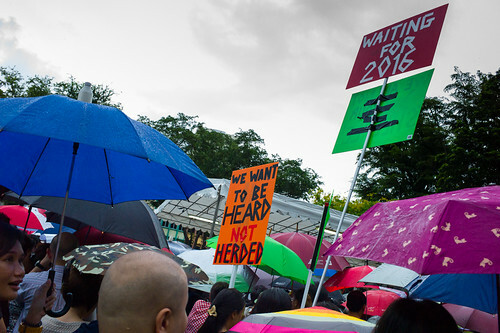 Waiting for 2016 – we want to be heard, not herded. Well said! The General Elections in 2016 will be very interesting indeed. The voice of the people cannot be ignored now. We have shown that we care, and we will act, if needed, to be heard.